Central Street Railway was founded by real estate investor Edwin K. Alsip and plumbing & tinware seller Leonidas Lee Lewis. Operating from the new 1879 Central Pacific depot at Second and H Street, which replaced the older depot at Front Street, Central Street Railway ran down J Street, a block from the City Street Railway tracks on K, and turned south at 28th Street. The line continued south past their horsecar barn at 28th and M, and eventually went outside the city limits, into the new suburbs of Highland Park and Oak Park. The eastern terminus was a public park, then known as Oak Park, on 35th Street and Fifth Avenue. The Central Street Railway's headquarters were at 1015 K Street. This office was also the center for Alsip's real estate sales, selling land in Oak Park and Highland Park. At the time, both neighborhoods were outside of Sacramento city limits, and there were tax advantages to building suburban homes outside of those limits. One important development that allowed Central Street Railway to reach Oak Park in reasonable time was the introduction of electric cars. The first electrics were battery-powered cars, introduced in 1888. These were not very successful, due to the era's primitive batteries, which ran down after only a few runs. These cars were taken out of service and the older horsecars reintroduced. 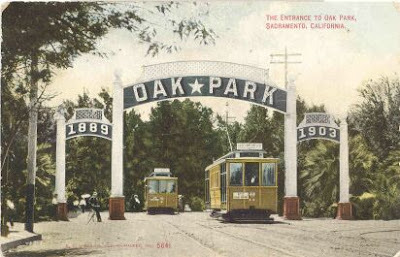 The idea of using cable cars, like those found in San Francisco, Los Angeles and other cities of the era, was considered, and at least one promotional poster for Oak Park real estate indicates the use of cable cars to Oak Park, but cable cars were made obsolete by the development of the overhead trolley. Central Street Railway introduced the first electric trolley cars to Sacramento in 1891. Generating power from their own coal-fired dynamo, they strung overhead wire along their routes and added electric motors and overhead poles to their cars. Electric cars were faster than horse-drawn cars, making the longer runs to Oak Park practical and economical, and solved many of the problems involved with horsecars, such as horse dung on the streets (which simplified street sprinkling and grading, an obligation of the streetcar company) and the short (and therefore expensive) service life of horses in streetcar service. Also in 1891, the Central Street Railway bought out Carey's City Street Railway. A probable side effect of the Central Street Railway's car lines is the spurring of development in midtown Sacramento. Anywhere the streetcar ran became an ideal location for retail business, offices, or restaurants. J and K Street still shows much evidence of this, as does 28th Street. Later streetcar lines also became retail corridors: Third, Seventh, Tenth, Fifteenth, Twenty-first (numbered streets) as well as M, P and T Streets (lettered streets) gained retail attention and higher land value largely due to close proximity to transit. Land along streetcar corridors was always more valuable than land farther away, so more intensive use was made of streetcar-adjacent property. Because it was easy to walk to the streetcar line, the streets within several blocks of the car line became attractive as residential neighborhoods. So, while its primary purpose was to motivate people to move to Oak Park and Highland Park, the streetcar had a beneficial effect on the intervening neighborhoods where it ran. Because riders could get on and off at will (you could simply flag down a car to get on, or jump off to exit) every point along the line became an equally convenient destination.